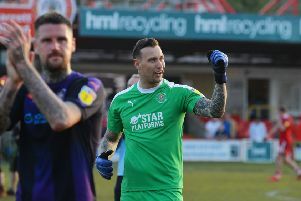 Blackpool boss Terry McPhillip was left feeling ‘gutted’ his side hadn’t prevented the Hatters from setting a new club record of 28 games unbeaten on Saturday. The Tangerines came closer than most, leading 2-1 with four minutes to go, Town reduced to 10 men with James Collins sent off too. However, Jason Cummings levelled the scores with an opportunistic effort, as McPhillips said: “It was eventful. Credit to our lads, they’ve come here and given the top of the league a really good scare, a good game, and probably should have won it. “We knew we couldn’t play wide open, so we had a bit of a plan, similar to Bradford, but these are the best team in the league by a distance. “You’d have to say the plan was working, then there was the sending off and I’m certain we should have had a penalty. “But we should have been more clinical, like we were at Bradford. “If Armand (Gnanduillet) puts his one away, we go and win the game, but they are the best team in the league and while there’s still one goal in it, they’re knocking on the door and throwing the kitchen sink at you. “In the end, it’s a really scabby one that has gone through the legs of someone.